DEAR BLESSED MOTHER AND ST BERNADETTE PLEASE PRAY ABD INTERCEDE TO OUR HEAVENLY FATHER IN JESUS NAME TO HELP ME GET OUT OF ALL THIS DEBT AND GET MY CONTRACTOR LICENSE IMMEDIATELY SO I CAN BEGIN MY BUSINESS WHICH WILL THRIVE SO I CAN MAKE SO MUCH MONEY THAT I LOST. PLEASE HELP ME TO GET PERFECT HOUSEMATES SO I DONT GET EVICTED FROM MY APARTMENT. ALSO FOR JONATHAN H TO COME BACK IN MY LIFE AS MY TRUE LOVE/BEST FRIEND AND FUTURE FAITHFUL HUSBAND FOR ETERNITY. Dear Blessed Mother, please ask Jesus to intercede for my family and I. Please protect and heal us Spiritually, mentally, physically and emotionally. Please heal our burdens of heart disease, fibromyalgia, depression, anxiety, diabetes, TMJ, sciatica, allergies, asthma and colon problems. 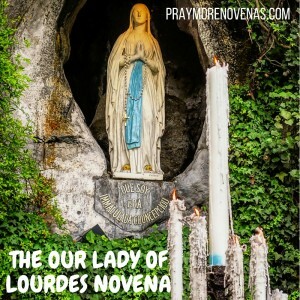 Dear Lady of Lourdes, thank you for being our Blessed Mother and your intercession. Thank God for St Bernadette and her intercessions for the following prayers today. Praying for all our holy Priest and may the Holy Spirit truly guide God’s people in this One Holy Apostolic Catholic Church. Praying that my husband’s faith grows stronger daily and he gets steady employment. That my faith will grow stronger and stronger daily and do God’s will to have a strong marriage. Praying for my brothers and sisters, and especially my brother GM who’s sick in the hospital. Pray for my sister MD that her eye pressure is stabilized and her inflammation is gone. Praying for my nieces who are now with child. My niece M.M to have a health baby a third child at age 41. My God-daughter, HD is expecting her 1st baby at 35 yrs. any day now. May your intercession be upon her for a healthy delivery. May the H.S touch her heart to have her baby baptized. My niece HD, having a second child and her concerns be resolved during this pregnancy. May she be touched by the H.S and have a desire to have her children baptized into the Catholic faith. Pray for my sick friends LA, SF who are suffering from respiratory problems and another with eye inflammation. I pray for my mom on her birthday and pray that she would have long life health and strength. Lord I place my financial needs into your hands Lord Jesus o pray for financial blessings. I pray fur money to finance my son’s wedding Blessed mother please intercede for me. Our Lady of Lourdes and Saint Bernadette pray with me for my nephew and his wife to return to the Catholic Church with a deeper faith for God’s love, forgiveness, and peace. Bless them with beautiful children who will be strong, healthy and holy, coming from an easy conception, with smooth pregnancies and quick, safe, uncomplicated deliveries. Make my nephew and his wife strong with Your Holy Spirit. Guide Jerry and me as we renovate our home making the right choices.